My Grandad was a milkman for Howard’s Dairies when deliveries were still made by horse drawn floats. My Grandad’s name was Alf Pepper and his horse’s name was Don. 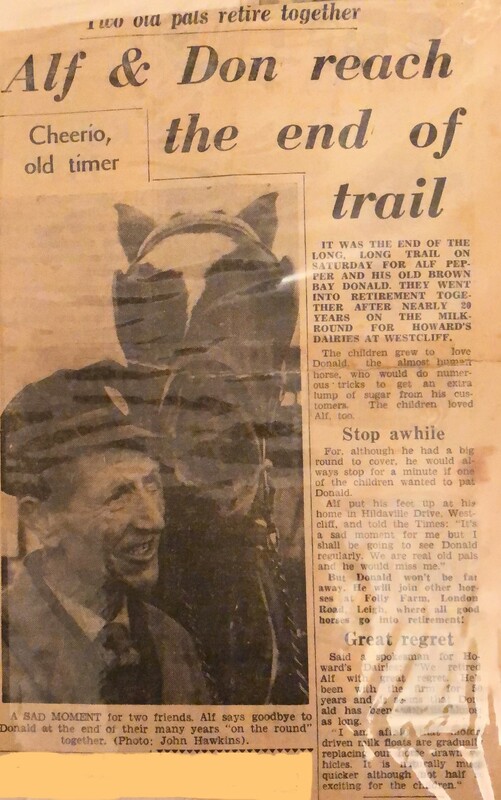 The newspaper clipping pictured below shows that he retired in 1961. 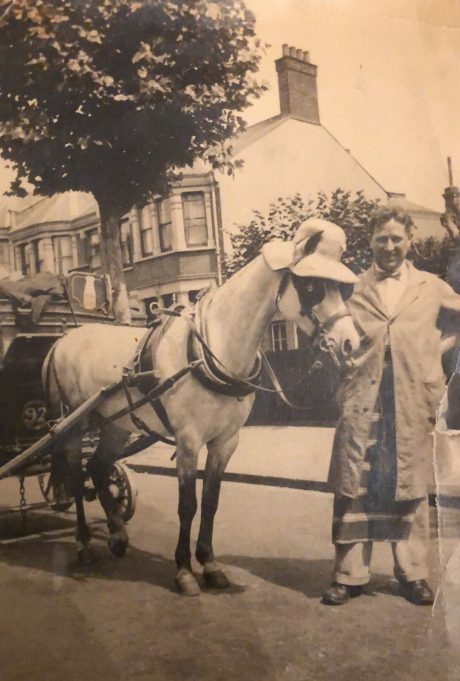 My Mum said that he was the last milkman in Southend area to use a horse drawn float. He used to ride his bike or walk from his home in Hildaville Drive, in Westcliff-on-Sea, to the Benfleet dairy to pick up his deliveries. My Grandad’s float had the number 92 on it (see photo below), does any body know what the number meant? My son’s friend restored milk floats and thinks that he has my Grandad’s one as it does have the number 92 on it. Transcript of the newspaper clipping below. IT WAS THE END OF THE LONG, LONG TRAIL ON SATURDAY FOR ALF PEPPER AND HIS OLD BROWN BAY DONALD. THEY WENT INTO RETIREMENT TOGETHER AFTER NEARLY 20 YEARS ON THE MILK ROUND FOR HOWARD’S DAIRIES AT WESTCLIFF. For although he had a big round to cover, he would always stop for a minute if one of the children wanted to pat Donald. But Donald won’t be far away. He will join other horses at Folly Farm, London Road, Leigh, where all good horses go into retirement!